Forget about expensive organic store bought almond milk. Make it at home for a fraction of the cost – unpasteurized and fresh. almond milk is rich in minerals such as Manganese, Magnesium, Phosphorus, Copper, etc. And regular dairy milk wins out in terms of protein content (roughly 150% that contained in almond milk) and calcium content (roughly 4 times that contained in almond milk). In the end, almond milk seems to complement dairy milk really well. It is a healthy alternative and whether you want to give up on dairy milk or not, it’s delicious, packed with nutrition and will add variety to your diet. So why not try it out and have some every so often? 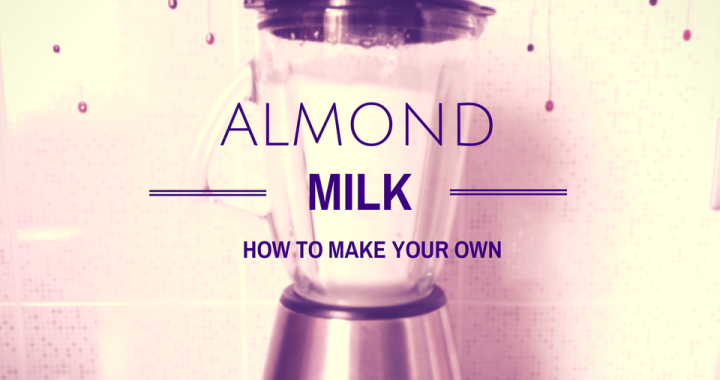 Now without further ado, here are my tips on making almond milk at home. Soak the almonds overnight with plenty of water and some salt. The salt and the soaking helps break down some enzymes which inhibit the digestion. Therefore, soaking the almonds actually makes them more easily digestible for our body. You can read more about why it’s beneficial to soak almonds here. I suggest you soak the almonds for 2 nights (but do rinse them after day 1) so that they get even creamier. Pro tip: don’t forget to close your blender tightly Also, use mineral or spring water to avoid the chlorine in tap water affecting the taste and enzymes of your almond milk. Do NOT use the water that you soaked the almonds in. Blend on high speed. It will take a few minutes until the milk seems to be as smooth as it’s ever going to get – at that point you have achieved the best with your blender and can move on to Step 3. Pour the milk through a sieve. Opt for a sieve that is not very fine. Ok, your sieve will get “clogged up” so you need to be stirring with a spoon. Once the mix in the sieve looks more like a paste, press it with the spoon to get all that gorgeous almond milk out. The final leftovers will have the consistency of dough. If your leftovers are too liquid, then your sieve is probably too fine. If you only have very little left in your sieve, then it may be not fine enough and your milk might have some “almond send” accumulating on the bottom. If you are not sure about this step and have several sieves at home, just give it a try and test which one does the best job. Step 4: It’s ready! Out of 1 cup soaked almonds and 2 cups of water, you will get about 2 cups of smooth, white, almond milk. You should now drink it, use it in a recipe (like vanilla chia seed pudding ) or put it back in the fridge. It will last a day or two but it’s best to use on the spot while those enzymes are activated and it tastes fresh and delicious. Pro tip: Do NOT throw away the leftover almond paste. You can use it as almond flour in a recipe. I will update this post with a recipe very soon but in the meantime use Google and find a tasty way to make the most of those almonds. This might seem like a bit of a hassle but honestly, the whole process took me 5 minutes – 30 sec. to put in the blender, 2 minutes to blend, 3 minutes to run through the sieve. I then took another 5 minutes to wash the blender, sieve and cups. So, don’t over-think this – grab some almonds now and put them to soak in the fridge. You can then make your own fresh almond milk tomorrow and once that happens, you will never go back to store-bought! What do you like to do with your almond milk? leave a comment below. Posted in Breakfast recipes, Dairy free recipes, Gluten free recipes, Healthy eating tips, Quick and easy recipes, Snacks, Sugar free recipes, Vegan recipes, Vegetarian recipes and tagged almond milk, calcium, dessert, eat healthy, homemade, minerals, nut milk, nutrition, protein.